Make Jedi Temple Archives One Of Your Online Stops On May The Fourth! Disney Store Exclusive Talking Stormtroopers Arriving To Homes!! It may not be May the Fourth yet, but JTA readers are letting us know their orders of the Disney Store Exclusive talking figures are arriving. JTA is able to provide you a first look at these arrivals thanks to some of our readers. Check out the 13" Talking Stormtrooper figure, exclusive to select Disney Stores. You want to know what the Stormtrooper says? Check this article out then! We're working on obtaining loose pics next. But click through for what JTA reader Chris has to say about this great toy! The first re-released books under the Legends banner are now available for pre-order. These will be available this Fall. Click below to check out the current details on both of these classics on Amazon.com. Sadly, no hardback versions. It's 10 years old to the day today, but see why Red Leader's X-wing Fighter (Death Star Trench) is basically a timeless release. We finally got a definitive pilot and astromech droid to accompany this vehicle in the beginning of 2009, but do you have this essential vehicle to go with them? Learn more in our Research Droids Reviews today. Be sure to leave your own thoughts in our comments section, vote in the poll or even leave comments about it on our Facebook page. Click the banner below for the direct link to the review! As always, you can also send your own personal review requests via email if you'd like to see something that we didn't cover yet. The latest news from Big Bad Toy Store is in. Stop by to see what's new. You can also get daily product news and updates by subscribing to BBTS's Facebook page and Twitter feed! BREAKING NEWS: Star Wars Episode VII Cast Officially Announced! BREAKING NEWS! The Star Wars Episode VII cast has been officially announced. StarWars.com has the details! You know about the awesome Toys R Us Star Wars 30% off promotion, but did you know that most stores will adjust your receipts, even beyond the normal timeframe? I just had my receipts adjusted, including the one of my first store report of wave 3 found in NJ back in the beginning of March receiving a total adjustment of over $70!!! Offer to do a survey and promise to give good marks. You can make this happen too. Click through for more. Even if you didn't care for Episode II, it's hard to deny that there were some great toys produced based on the film. Another goo vehicle is the Zam Wesell Speeder, complete with cool battle-damage crush play feature and a gorgeous paint job. It's all in our Research Droids Reviews today. Be sure to leave your own thoughts in our comments section, vote in the poll or even leave comments about it on our Facebook page. Click the banner below for the direct link to the review! As always, you can also send your own personal review requests via email if you'd like to see something that we didn't cover yet. Sideshow Collectibles Ramping Up For May the 4th! Sideshow Collectibles is gearing up for May the 4th in a big way! You can start celebrating with them right now by entering to win a Life-Size Darth Vader Bust! And, starting on May 1st they will begin revealing new Star Wars products daily. I think we can already tell which one will be the recently revealed R2-D2! What else is coming? Click through to check out their tease page! Be sure to stop by our comments to place your guesses as to what the teases reveal! Sideshow Collectibles officially announces the long-awaited R2-D2 sixth scale figure! Click through to watch the preview video and prepare to be absolutely amazed! Pre-order details coming soon! Entertainment Earth has a few hot Daily Deals today. For today only you can get 30% off of both Han Solo (Hoth Gear) and Zuckuss Gentle Giant Jumbo Vintage Kenner Figures. Entertainment Weekly posts an article online that Harrison Ford, Carrie Fisher and Mark Hamill have all been spotted in London, just as filming for Episode VII is beginning. Click through for more! Even if you didn't care for Episode II, it's hard to deny that there were some great toys produced based on the film. One vehicle in particular that we feel looks great is the Anakin Skywalker Speeder, complete with a cool battle-damage crush play feature and a gorgeous paint job. It's all in our Research Droids Reviews today. Be sure to leave your own thoughts in our comments section, vote in the poll or even leave comments about it on our Facebook page. Click the banner below for the direct link to the review! As always, you can also send your own personal review requests via email if you'd like to see something that we didn't cover yet. There is another.... license. Anovos is revealed as the latest licensee and their focus will be Star Wars costuming. Full details to be revealed May 4th. Catch the full article on CNET.com! Catch up with The Realm Recap: Episode 11 and Episode 12, including Jayson's visit to Disneyland! Click through for more! Here is the latest from JTA sponsor Dorkside Toys! Click through for more! 30% Off The Black Series 6" Stormtrooper? Yep! Toys R Us is running a great Star Wars sale. Many (most) items are 30% off including The Black Series. Special thanks to JTA readers James C. and William G. for the alert. I totally missed this one! Click through for an incredible report from William with photographic proof of the deal! K & C Collectibles has Black Series 6" Wave 3 and 3 3/4" Wave 3 in-stock.&nbsp; We also have added 80 Hallmark Keepsake Ornaments, LEGO sets and much more. Click through for a complete list of recently added items. IT'S OUR 1800TH REVIEW! (That's just plain insane.) Although we reserved today's review for an old item, we like to save some of the "bigger" stuff for the "landmark" reviews. Revisit with us the 2002 Star Wars "Saga" Geonosis Battle Arena playset, a fine item that was released in support of Attack Of The Clones. It's a toy that we frankly adore. It has multiple play areas and levels, and comes with some great tooling, even though it isn't remotely close to being in scale. See our commentary and 68 image gallery, complete with dioramic displays for your enjoyment. It's all in our Research Droids Reviews today. Be sure to leave your own thoughts in our comments section, vote in the poll or even leave comments about it on our Facebook page. Click the banner below for the direct link to the review! As always, you can also send your own personal review requests via email if you'd like to see something that we didn't cover yet. With the recent announcement that the new novels that will be canon in the Star Wars Universe, and the official news that the old Expanded Universe is no longer valid in the Star Wars Universe, some type of separation now exists in the Star Wars timeline as we know it. Essentially, everything outside of the new canon is wiped from the timeline for a fresh start, unless some of the novels of the past are canonized. So, with that we now have two distinctly different Star Wars Universes to cope with: The Expanded Universe and the Canon Universe. Or, the EU and the CU. The covers for the first four novels in this new Canon Universe have been revealed. Here is another droid from the STAR TOURS sub-line. Today we look at SK-Z38, an odd vulture like droid that just isn't nearly as interesting as an astromech droid. Check it out in our Research Droids Reviews today. Be sure to leave your own thoughts in our comments section, vote in the poll or even leave comments about it on our Facebook page. Click the banner below for the direct link to the review! As always, you can also send your own personal review requests via email if you'd like to see something that we didn't cover yet. This week Brian's Toys has posted a video detailing the the awesome condition of the original He-Man 8-Back AFA 85 action figure. The video is in HD and shows off the back and front. Brian's Toys is also taking pre-orders on Gentle Giant's new 12-inch TIE Fighter Pilot vintage jumbo figure and Mission Series Wave 3. Marvel collectors will also want to pre-order the next Infinite Series waves coming in a few short months. TBS Bastila Shan Available For Pre-order At Amazon.com RIGHT NOW! The Black Series Bastila Shan is available for pre-order at Amazon.com. Special thanks to friend Jesse A. and JTA reader Mauricio M. for the heads up!. Following today's announcement of Lucasfilm's new unified storytelling approach, Disney Publishing Worldwide is proud to announce their first step into that larger world, beginning with Del Rey Books. Click through for more. At Toy Fair this year, Jedi Temple Archives first alerted you that the Expanded Universe was changing, that it is dead as we know it. Now StarWars.com is confirming that "Star Wars Episodes VII-IX will not tell the same story told in the post-Return of the Jedi Expanded Universe", which now lines up with the concerns lovers of the EU had. All previous EU will now be housed under a Star Wars: Legends banner instead. StarWars.com comes clean about their plans with it and confirm a lot of what we reported to you back in February as well as a whole bunch more. They explain how past, present and future EU will be categorized going forward. It's an interesting read and watch for sure! Click through for more. MakingStarWars.net is reporting that there may be some difficulty with approaching the Boba Fett standalone film. Click through for what they've culled from their time at the Executive Breakfast at Disneyworld. Although part of the Expanded Universe side of Star Wars, some of the neatest droids came out of the STAR TOURS sub-line. During the second phase of the Star Wars "Saga" line, Hasbro gave us three new ones. 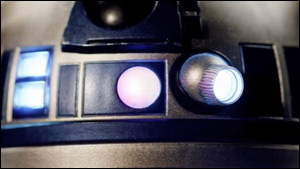 Today we look at R5-D2, an R5-D4 looking astromech droid that has some severe battle damage thanks to an awesome paint job. Check it out in our Research Droids Reviews right now. Be sure to leave your own thoughts in our comments section, vote in the poll or even leave comments about it on our Facebook page. Click the banner below for the direct link to the review! As always, you can also send your own personal review requests via email if you'd like to see something that we didn't cover yet. Welcome to our next Q and A of the Day post! This column will be published daily, weekly, monthly, or just based on how many questions I get emailed – but no more than one a day. Feel free to send in your questions and I will put them in the queue. Click through for Q and A of the Day: Day 60. Topic: I want my Kenner ROTJ figures! With special thanks to JTA reader James S. and moderator Paul B., we have better clearer details regarding the Kmart sale happening right now in your area! Click through for more information and images. DisneyStore.co.uk Has Talking Figures IN STOCK And Are SHIPPING Them! UK readers: RIGHT NOW you can order the newly revealed Talking Star Wars figures at disneystore.co.uk!. In stock are Darth Vader, Stormtrooper, Luke Skywalker and Han Solo. JTA reader zx_spectrum_30 has successfully pre-ordered the Stormtrooper and per the order will ship in 5 days! Place your orders now, especially since these will see limited distribution as confirmed by our report! We are receiving conflicting reports about the UK Disney Store report we posted HERE. We have now received word that other stores outside of Central London will indeed be getting the merchandise as well. We will have to wait for more confirmation, but for the time being, take the original report with a grain of salt. This is great news for those who live outside of central London. UPDATE: [THIS IS FROM A SOURCE WITH DIRECT ACCESS TO DISNEY REPS.] OK - just got clarity on the Talking Figures at Disney - on the phone as I type. They will initially only be available in the larger Disney Stores across Europe. If they sell well then Disney will look again. So stores such as the bigger ones in Manchester and Liverpool will see the figures but smaller stores won't. It looks like our original report was accurate, folks. Amazon.com has the latest The Black Series figures up for pre-order. It might be good to lock these down just in case! You can always cancel the orders! You can find both the 3.75" and the 6" inch figures listed. The 3.75" are going for $10.99 and the 6" are $22.99. Both qualify for Amazon Prime and free shipping. You have to dig through the search pages to find them, or you can click on any image below to jump straight to the product. Sideshow Collectibles' exclusive Clone Trooper Deluxe (212th Attack Battalion) has just been released and it's featured in our Research Droids Reviews today. The new phase II helmet sculpt is stunning and their clones look better than ever because of it. Be sure to leave your own thoughts in our comments section, vote in the poll or even leave comments about it on our Facebook page. Click the banner below for the direct link to the review! As always, you can also send your own personal review requests via email if you'd like to see something that we didn't cover yet. Listen up readers from the UK! We have just received word from JTA reader zx_spectrum_30 that the newly revealed talking Star Wars figures (which range between 12" and 15" by the way) will ONLY be available at three (3) central London Disney Store locations..
UPDATE: While a few stores outside Central London will receive these figures, Disney is test-marketing them in the larger stores only first. If they do well then they will ship them out to the smaller stores. Here is an experimental Research Droids Reviews entry. To date, we have never added a Hasbro 12 Inch Figure to our archives, but that changes today as we revisit the KB Toys exclusive Gamorrean Guard. If we get a good response, we'll keep looking at this scale from Hasbro. A great sculpt, but with a not-so-great paint job, see why we still have some affection for Hasbro's 12 Inch Gamorrean Guard even today. Be sure to leave your own thoughts in our comments section, vote in the poll or even leave comments about it on our Facebook page. Click the banner below for the direct link to the review! As always, you can also send your own personal review requests via email if you'd like to see something that we didn't cover yet. Our friends at Yakface.com are releasing additional new information on the Disney Store VIP event in California. Just announced: a new scale of Disney Store exclusive TALKING articulated figures FOR $29.95 each. The scale is a bit murky at the moment, but they look closer to 12" scale. Check out the awesome Darth Vader, Stormtrooper, Luke X-wing Pilot, and I don't know how you feel, but the Han Solo looks freaking fantastic. See them as well as a ton of other Disney Store exclusives right now! UPDATE 1: JTA reader Johnny W.O. writes in our comments that he read these figures are 18" per a Disney-themed website. Holy moly! UPDATE 2: It has been confirmed that these figures range from 12" to 15". Our friends at Yakface.com, attending the VIP event in California, have the scoop on upcoming May the Fourth Disney Store events. Check it all out here. The KB Toys exclusive Imperial Dogfight TIE Fighter was eagerly anticipated during the Star Wars "Saga" line, but it is very far from perfection. See how well it ranks in the Star Wars line by checking out our Research Droids Reviews today. Be sure to leave your own thoughts in our comments section, vote in the poll or even leave comments about it on our Facebook page. Click the banner below for the direct link to the review! As always, you can also send your own personal review requests via email if you'd like to see something that we didn't cover yet. "I guess Roy isn't doing as well as they first thought." We regret to inform you that HasbroToyShop.com appears to have pulled the plug on any more future stock of the 3.75" Darth Plagueis and the 6" Boba Fett figure in The Black Series line. We honestly believe there is nothing to fear with the latter. After all, a fabulous new assortment has just been confirmed which includes another take at him. But for those that don't roll the dice, may we suggest securing that figure before it's too late. As you know, "the media is so secretive" about these sorts of things. Special thanks to vikingrobot for the alert! JTA sponsor Dorkside Toys sends us their latest updates! You know what to do! Click through for more! Twelfth Parsec has one final important update! Check it out by viewing their latest YouTube.com video! Click through for more details!! Welcome to our next Q and A of the Day post! This column will be published daily, weekly, monthly, or just based on how many questions I get emailed – but no more than one a day. Feel free to send in your questions and I will put them in the queue. Click through for Q and A of the Day: Day 59. Topic: Who do you want to see announced for The Black Series 6" line? Super 7 has reached out to us to help promote a fine art upcoming event for May the Fourth. Click through for details!! Star Wars: Rebels Exclusive Clip! On their YouTube page, StarWars.com reveals a cool clip from the upcoming Star Wars: Rebels television show! Jumbo Vintage Imperial TIE Fighter Pilot Revealed! The site ActionFigureInsider.com reveals the Gentle Giant Ltd. Jumbo Vintage Imperial TIE Fighter Pilot figure. Check out the news! Although a bit difficult to find at the time, the 2003 Star Wars "Saga" Darth Tyranus's Geonosian Speeder Bike is a a nicely tooled vehicle. The pack-in figure isn't too bad either. See why we also like this set in our Research Droids Reviews today. Be sure to leave your own thoughts in our comments section, vote in the poll or even leave comments about it on our Facebook page. Click the banner below for the direct link to the review! As always, you can also send your own personal review requests via email if you'd like to see something that we didn't cover yet. Coming this November: The Ultimate Guide To Vintage Star Wars Action Figures. Make sure to check this out, as it might be a great resource to add to your reference collection! JTA wishes all of our readers and friends a very Happy Easter on this beautiful day! Star Wars Collectors Cast looks back at the questions we asked Hasbro after their presentation during last month’s New York Toy Fair, with guest Paul Harrison from JediTempleArchives.com. As usual there’s a roundup of the latest news and rumors and our regular visit to Steve Sansweet at Rancho Obi-Wan (the home to the world’s largest Star Wars collection) – all not to be missed! Although a bit difficult to find at the time, the 2003 Star Wars "Saga" Anakin Skywalker's Swoop Bike is a truly excellent vehicle. The pack-in figure is less than desirable, but you shouldn't shun this set because of that. See why in our Research Droids Reviews today. Be sure to leave your own thoughts in our comments section, vote in the poll or even leave comments about it on our Facebook page. Click the banner below for the direct link to the review! As always, you can also send your own personal review requests via email if you'd like to see something that we didn't cover yet. The Black Series 6" ALREADY Found In USA Walmart Stores? Oh my heck!? JTA reader Aaron has found a TBS 6" Greedo at his local Walmart.... in Florida.... recently. Click through for his report. Did You Take Advantage Of The Kmart Sales? The news surrounding Kmart exclusives on sale has made the rounds, now JTA moderator Sjefke provides proof of it. The deal ended to day, but readers are sending in their scores. Click through for the proof. The Target exclusive A-wing Fighter may not be part of the Original Trilogy, but it's still one of the most nicely decorated vehicles we have ever seen. Based on a Galoob Micro Machines Action Fleet release, Hasbro follows suit and releases their own version of it in 3.75" scale. Learn all about it in our Research Droids Reviews today. Be sure to leave your own thoughts in our comments section, vote in the poll or even leave comments about it on our Facebook page. Click the banner below for the direct link to the review! As always, you can also send your own personal review requests via email if you'd like to see something that we didn't cover yet. Walmart To Soon Carry The Black Series Six Inch Line? We have received some preliminary information that Walmart might be carrying The Black Series 6" line once it resets into the new blue line look. Details are unclear at the moment, but we will continue to dig into this for further confirmation. If you are a Walmart employee and have more details to add to this, please contact us and let us know. Thank you. The Toys R Us exclusive Luke Skywalker And Landspeeder set was a very exciting release, but it was met with some trepidation by collectors because of how badly it was colored. Thankfully, we all received a spot on update in The Vintage Collection, but see this sculpt's roots in our Research Droids Reviews today. Be sure to leave your own thoughts in our comments section, vote in the poll or even leave comments about it on our Facebook page. Click the banner below for the direct link to the review! As always, you can also send your own personal review requests via email if you'd like to see something that we didn't cover yet. First Prop Evidence Of Star Wars Episode VII? We are trying our darndest to NOT post anything about Episode VII, but when one comes across news like this, it's hard to hold back. While there is no proof, it looks like the first prop from Star Wars Episode VII has been leaked via this photograph. Could it be the foot of an AT-AT? (Probably not, but we can dream can't we?) Click through to read the article at The National! Never Give Up The Fight! Stormtroopers Still Hitting Hard! We are getting continuous reports of great TBS 6" Stormtrooper finds, but we had to share this one with you. Eager JTA reader Niko wanted to share his exuberance with the rest of our readers as well. He has desperately been trying to secure two 6" Stormtroopers for himself and his son. He constantly missed it at HTS and others had beat him at the brick and mortar level in the past. That has all change as his determination and patience finally paid off. Click through for his wonderful tale! Pre-order TBS 6 Inch Wave 4 With Stormtrooper And Boba Fett Now! JTA sponsor Dorkside Toys has the awesome new wave 4 assortment up for pre-order for only $79.99 and a low $5.99 flat rate shipping. Place your order now and tell them JTA sent you!! Although Entertainment Earth has this case showing an availability of June 2014, we were just informed by Dorkside Toys that these are actually coming in July. UPDATE: Pre-order singles of the Stormtrooper or Boba Fett for $24.99 and $21.99 respectively! BREAKING NEWS! The carry-forward figures in The Black Series 6" wave 4 are Stormtrooper and Boba Fett. Eat dirt scalpers! Entertainment Earth has the proof!. The Goldbergs is a really great show, but now it's even better. Set in the 80s in the Philly area, creator Adam Goldberg is working on a Star Wars themed episode for May 6th. Special thanks to friend Chris S. for the alert!! TVGuide.com has the story! Click through for more. Check out the details for this year's Spring Cleaning Sale in the latest Big Bad Toy Store Newsletter. You can also get daily product news and updates by subscribing to BBTS's Facebook page and Twitter feed! Starting today, we are taking our next break from the Power Of The Jedi line, but worry not as we will return to it again in May. In the meantime, let's revisit looking at some more of the quality products released in the Star Wars "Saga" line (as well as a few other surprises). First up, we check out Luke Skywalker's X-wing Fighter, another awesome Toys R Us exclusive with a unique R2-D2 pack-in figure and awesome accessories. It's all in our Research Droids Reviews today. Be sure to leave your own thoughts in our comments section, vote in the poll or even leave comments about it on our Facebook page. Click the banner below for the direct link to the review! As always, you can also send your own personal review requests via email if you'd like to see something that we didn't cover yet. JTA moderator Sjefke has created another stunning custom figure: Wam "Blam" Lufba. Be sure to check out this work of art!! Click through to see it all, complete with work in progress and reference photos. The Toys R Us Imperial AT-ST & Speeder Bike brought us the first moderm Paploo action figure, but it really didn't deliver too much quality. See more in our Research Droids Reviews today. Be sure to leave your own thoughts in our comments section, vote in the poll or even leave comments about it on our Facebook page. Click the banner below for the direct link to the review! As always, you can also send your own personal review requests via email if you'd like to see something that we didn't cover yet. The Black Series Darth Plagueis For $0.00? Almost! What more can go wrong? Well, maybe this isn't so bad for JTA reader Gary H., but it's not a great testament to the health of the Star Wars brands or a good sign that retail has a remote clue of what's going on anymore. Click through for this unbelievable retail experience. Despite the "anything but scintillating" recent drama surrounding The Black Series 6" Stormtrooper, we are still getting reports from readers that they are finding this figure locally. Interestingly, this is the second closest TRU to my own personal residence. So stay away lord varion! Click through for his success story! JTA reader Jamie writes in with some possibly good/possibly unsettling news about The Black Series 6" line at his Canadian TARGET. Click through for more. The site StarWars.com has been given a whole new look. Go and check it out. Special thanks to our friends at Yakface.com for the alert! Even though we got this vehicle in The Vintage Collection packaging, the 2001 POTJ B-wing Fighter, a TARGET exclusive, has the best paint job by far. See why the others don't come close in our Research Droids Reviews today. Be sure to leave your own thoughts in our comments section, vote in the poll or even leave comments about it on our Facebook page. Click the banner below for the direct link to the review! As always, you can also send your own personal review requests via email if you'd like to see something that we didn't cover yet. You saw our earlier report today, but anyone doubting why Hasbro SHOULD indeed flood the market with hot Star Wars figures need to look no further than this eBay auction of 10 TBS 6" Stormtroopers with a starting/recommended bid of $500 which is $300 higher than what they should cost. The madness that HasbroToyShop started today with a "one per lifetime" maximum of this figure is enraging, and once scalper scum get a whiff of that craziness, prices will only go higher. Don't think for a minute that limitations will help you secure one for your collection. Only by Hasbro constantly releasing and re-releasing these hot figures will put an end to this nightmare. Hasbro should have the right to pull auctions like this if you want my opinion! Oh, and better case assortments will only help. But who knows when that will improve (in this scale at least). Check out the latest from JTA sponsor Dorkside Toys by clicking through. Another week has passed and it’s time for their look back at the latest news in Star Wars collecting. On this episode of The Realm Recap Yakface.com chats about various customizing features including a one-off Black Series style box for a recent custom 6" figure Jayson acquired, pre-order solicitations from Sideshow, a canceled Darth Maul game and more. Click on through to check out the latest episode and feel free to subscribe to our channel and leave suggestions on what you’d like to see covered (more or less) on the show. Also, if you prefer not to look at their ugly mugs, a downloadable MP3 is available as well. Bad Planning Breeds Insanity: A One Per Lifetime Limit On TBS Stormtrooper? Well, this one is just going to make you go "Huh?" The hard to secure 6" Stormtrooper has been bobbing in and out of stock all day today at HasbroToyShop.com. Unable to meet demand of The Black Series 6" Stormtrooper, they've put a very aggressive limit on this awesome figure. Are you curious to know more? Then click through for the scoop! The very first modern TIE Interceptor was released as a Toys R Us exclusive in 2001, during the Power Of The Jedi line. See this enhanced release in our Research Droids Reviews today. Be sure to leave your own thoughts in our comments section, vote in the poll or even leave comments about it on our Facebook page. Click the banner below for the direct link to the review! As always, you can also send your own personal review requests via email if you'd like to see something that we didn't cover yet. It's been a while, but Mats from Sweden has another incredible tale to tell in Sweden. Can you imagine finding MULTIPLE TVC Emperor's Royal Guards at your local Toys R Us even today? More big fish tales like this await you so click through for more!! And Mats, JTA is so sorry for your loss. You're in our thoughts and prayers. Arguably, the greatest release of 2002 was the Walmart exclusive TIE Bomber. The pack-in figure was a joke, but Hasbro made an all-new sculpt to a long-awaited vehicle that never was made in the vintage Kenner era. Although released multiple times since, see the very first version of this iconic vehicle as we continue to look at some of the best exclusive vehicles, specifically in the Power Of The Jedi line, in our Research Droids Reviews today. Be sure to leave your own thoughts in our comments section, vote in the poll or even leave comments about it on our Facebook page. Click the banner below for the direct link to the review! As always, you can also send your own personal review requests via email if you'd like to see something that we didn't cover yet. Jumbo Holiday Yoda With Micro Vintage Kenner Boba Fett IN STOCK! With special thanks to Jub Goobles for alerting us to this, the Jumbo Holiday Yoda, complete with micro vintage Kenner Boba Fett is in stock for PGMs only. Order yours now because it won't last long!! Hey Canada! If you have L'entrepot du Jouet in your hometown, you best get there right away, especially if you need the 6" Stormtrooper. Click through for more! UPDATE: It's ALSO IN STOCK on their website for $22.99 as of this post time RIGHT HERE. Check out what our friend Jayson Krebsbach made. If only Hasbro could make this for us in turn! Check it out on Yakface.com's Facebook page. Many of us have been discontent with what Hasbro is providing in the collectors' market currently. But when you look at an item like Luke Skywalker's Snowspeeder, a tremendous exclusive from 2002's Power Of The Jedi line, you almost have to reexamine why you would be complaining now when great things like this have already been released in the past. Before you become defensive, come with us as we look at some of the best exclusive vehicles, specifically in the Power Of The Jedi line, in our Research Droids Reviews beginning today. Be sure to leave your own thoughts in our comments section, vote in the poll or even leave comments about it on our Facebook page. Click the banner below for the direct link to the review! As always, you can also send your own personal review requests via email if you'd like to see something that we didn't cover yet. JTA has teamed up with Calum Jones to bring you a monthly look at some of the best in action action figure photography on the internet! Each month we will feature a hand-picked selection from Calum's body of work to show off, in high resolution, what happens when you combine creative photography skill with digital artistry. The results will blow you away! We will be spotlighting some of the many samples featured on Calum's highly popular Instagram page, along with several exclusive photos that will only be available right here on JTA! Not only will you get to see the final results of his hard work, but each month we will also feature a Concept to Creation storyboard image showing you how Calum prepares for his final composition. Please let him know what you think in our comments section, I'm sure he would love to hear your opinions, suggestions, and requests! Click through for the full gallery! If you think Chewbacca (Dejarik Champion) looks like a POTF2 leftover, you wouldn't be more correct. Originally planned for the Comm Tech line, plans were shelved as interest in Episode I began waning before it was expected. Once the Power Of The Jedi line was realized, he was one of the first candidates for release in the new line. She why he's an appreciated figure, but far from a good figure in our Research Droids Reviews today. Be sure to leave your own thoughts in our comments section, vote in the poll or even leave comments about it on our Facebook page. Click the banner below for the direct link to the review! As always, you can also send your own personal review requests via email if you'd like to see something that we didn't cover yet. How To Make A Season 5 Version Of Barriss Offee! JTA moderator Sjefke was commissioned by longtime JTA reader Scott to make a Season 5 version of "evil" Barriss Offee. Click through to lean how he did it! Is it just me, or are you immediately reminded of a blooper from Toy Story when Mrs. Potato Head advised Mr. Potato Head to pack his "angry eyes" when you read Sjefke's tutorial? Well Painted 5POAs May Be The New Valuable Chase Figures, Folks! It's almost next to never that I see new figures in my area, but I was a little surprised to see the latest Saga Legends figures in stock at my local Target. From the same exact case, both Boba Fett and the Stormtrooper had horrid paint operations. I know this is no surprise, but for goodness sake, when will Hasbro tighten up the quality issues? Boba Fett had a big green space where the paint didn't reach and the Stormtrooper's right eye was dripping off the side of his face. Remember, these came from the same exact case. I didn't even bother to look at Cody and Rex because I lost interest quite quickly. Check out the mess! The Sideshow Collectibles Premium Format Savage Opress is now available for pre-order! Click through to check out the full gallery and ordering information! The Black Series is even making its way as far out as Scotland! Look what JTA reader Darth G. has found in his neck of the woods!! Run To Kmart! Amazing TBS Deals! There are some great Star Wars The Black Series deals at Kmart! Look what JTA reader Anakin20 found!! Welcome to our next Q and A of the Day post! This column will be published daily, weekly, monthly, or just based on how many questions I get emailed – but no more than one a day. Feel free to send in your questions and I will put them in the queue. Click through for Q and A of the Day: Day 58. Topic: 3.75" Jabba the Hutt again? UPDATE: Maybe it really does need a re-release as soon as possible. Look at what the shocking after-market value on eBay is! It's hard making the same old Star Wars characters fresh in the basic action figure line, but Hasbro was successful because they actually looked for subtle differences in costumes and then worked them into new versions. Han Solo (Death Star Escape) might seem like the same old Han Solo action figure, but this version comes wearing a Stormtrooper belt. Find out why this is a figure to consider in our Research Droids Reviews today. Be sure to leave your own thoughts in our comments section, vote in the poll or even leave comments about it on our Facebook page. Click the banner below for the direct link to the review! As always, you can also send your own personal review requests via email if you'd like to see something that we didn't cover yet. Big Bad Toy Store posts their latest pre-orders and new arrivals, as well as details on this year's Spring Cleaning Sale. Click through to see what's new! You can also get daily product news and updates by subscribing to BBTS's Facebook page and Twitter feed! The Saga Legends Stormtrooper is IN STOCK as of this posting time at ToysRUs.com for $5.99 in case you still need him. Hurry up Jayson! BoShek is probably more famous for being lampooned than for being a great action figure. See why we think it's a solid figure in our Research Droids Reviews today. Be sure to leave your own thoughts in our comments section, vote in the poll or even leave comments about it on our Facebook page. Click the banner below for the direct link to the review! As always, you can also send your own personal review requests via email if you'd like to see something that we didn't cover yet. Twelfth Parsec Ewok Hut Latest Update! Twelfth Parsec sends a NEW update with regards to their custom Ewok village playset pieces. Click through for the update!! Sadly, we didn't get this post in enough time, but we wanted to apprise readers of their status. Another week has passed and it’s time for Yakface.com's look back at the latest news in Star Wars collecting. On this episode of The Realm Recap they chat about the possible delay of Chewbacca from the 6" The Black Series line, new images from LEGO, another great round of custom figures, pre-order announcements from Sideshow and much more. Click on through to check out the latest episode and feel free to subscribe to their channel and leave suggestions on what you’d like to see covered (more or less) on the show. Three Dollar Star Wars Figures In Canada Dollarama Stores! Hey Canadians! If you have a Dollarama in your area, you may want to check out what kind of Star Wars stock they have. JTA reader Mike M. writes in to share that figures (mostly Movie Heroes) can be found for $3.00 each. Click through for more! The Bespin Guard (Cloud City Security) figure is so good, and so bad; all at the same time. See why this figure is its own paradox in our Research Droids Reviews today. Be sure to leave your own thoughts in our comments section, vote in the poll or even leave comments about it on our Facebook page. Click the banner below for the direct link to the review! As always, you can also send your own personal review requests via email if you'd like to see something that we didn't cover yet. Peter Mayhew To Reprise His Role As Chewbacca? According to Hollywood Reporter Peter Mayhew is going to be reprising his role as Chewbacca for Episode VII. Click through for the full story! A fantastic figure released in 2001 was Lando Calrissian (Bespin Escape). Hasbro ensured that they got the sculpt right and decided to forgo super-articulation. With a soft-goods cape that likely will NEVER be done better, see why this is one version of the old 'smoothy' that you'll definitely want to secure for your collection. All the facts await you in our Research Droids Reviews today. Be sure to leave your own thoughts in our comments section, vote in the poll or even leave comments about it on our Facebook page. Click the banner below for the direct link to the review! As always, you can also send your own personal review requests via email if you'd like to see something that we didn't cover yet. JTA moderator Sjefke writes in to alert readers that the Kmart The Vintage Collection exclusives are on sale. The two-packs are on sale for $12.79 and the Ewok Catapult is on sale for $16.79. I have no idea how long they are on sale for because the photos were so tiny, but if anyone else knows, please post in our comments. Your mileage may vary. Texas Walmart Comes Through For Collectors! Will Other Areas Also? It's a pre-Christmas miracle! Wave 3 of The Black Series 3.75" line has hit Walmart in Texas. Check out the report from JTA reader EG! Click through for more! In case you haven't seen this yet, we have a quick pic of the Toys R Us clearance program explained. Click through for more! JTA sponsor Dorkside Toys is STILL taking pre-orders for the latest The Black Series figures, including single figures for a mere $10.99 each! Click through for more! A newly updated version of 2001's Power Of The Jedi Leia Organa (Bespin Escape) is strongly 'rumored' for The Black Series this Fall, but see that upcoming figure's ancestor in our Research Droids Reviews today. Be sure to leave your own thoughts in our comments section, vote in the poll or even leave comments about it on our Facebook page. Click the banner below for the direct link to the review! As always, you can also send your own personal review requests via email if you'd like to see something that we didn't cover yet. JTA reader Kam was out looking for 6" The Black Series Stormtroopers, but look what he found at his local comic shop instead. See his report by clicking through! Figures Are STILL Arriving Folks! Darth Plagueis is still CONSISTENTLY being found amongst JTA readers. Read Jub Goobles' latest report by clicking through! JTA reader Caleb sends us an interesting store reports and asks fellow readers a question. See if you can help him out. I have to say I have never seen anything like this at my local TARGET. Click through for more! The very first basic figure to receive two ball-jointed shoulders was 2001's Power Of The Jedi Han Solo (Bespin Capture). Certainly not perfect, it was a tremedous update to the 1997 POTF2 figure. Check out this ground-breaking action figure in our Research Droids Reviews today. Be sure to leave your own thoughts in our comments section, vote in the poll or even leave comments about it on our Facebook page. Click the banner below for the direct link to the review! As always, you can also send your own personal review requests via email if you'd like to see something that we didn't cover yet. Black Series 3.75" Wave 4 and Marvel Legends Guardians of the Galaxy highlight this week's Brian's Toys newsletter. The Black Series Wave 4 comes with 6 new figures, including Bastila Shan, Snowtrooper, Luke Dagobah, Yoda, Dak Ralter, and Toryn Far! Also new this week are some nice Vintage 12" AFA and a mint-in-box Empire Strikes Pack Six Pack. For more from this week's newsletter visit Brian's Toys! In 2001, Hasbro created an awesome "playset" and worked it into the Deluxe format. The Luke Skywalker (In Echo Base Bacta Tank) not only gave collectors an all-new Luke action figure in his medical Depends, but it also gave us the very desired bacta tank and a few other environmental pieces and cool features as well. See why this is a must-have for your collection and check out how awesome other action figures interact with it in our Research Droids Reviews today. Be sure to leave your own thoughts in our comments section, vote in the poll or even leave comments about it on our Facebook page. Click the banner below for the direct link to the review! As always, you can also send your own personal review requests via email if you'd like to see something that we didn't cover yet. More Of The Worst Paint Jobs You Will Ever See! JTA reader Jesse received his 6" The Black Series Luke Skywalker (Bespin) figure with one of the worst paint jobs I have seen to date. Check out this debacle! Twelfth Parsec Ewok Hut Update! Brent at Twelfth Parsec writes in with an update to the Ewok Tree Hut custom playset. They need your help! Click through for more! JTA reader Andy M. from NZ writes in with an interesting store find. Please click through to find out why this is such an odd store find! HasbroToyShop.com is running another PROMO code through April 7th. Use code FRIENDS14 for FREE shipping and 20% off. Special thanks to JTA reader gbhicks for the notice!! The Big Bang Theory TV show and Lucasfilm Ltd. team up together to deliver a May the Fourth themed special episode (airing May 1st). Yahoo.com has the story! Special thanks to JTA reader studlydudly for the alert! Congratulations to our very good friend James Burns at JediNews.co.uk for his television gig on the UK's Collectaholics TV show. Click through to read more!. The Power Of The Jedi line brought the first concept art figures based on The Phantom Menace to collectors. Obi-Wan Kenobi (Jedi Training) is the last one in this particular line. See this figure in depth in our Research Droids Reviews today. Be sure to leave your own thoughts in our comments section, vote in the poll or even leave comments about it on our Facebook page. Click the banner below for the direct link to the review! As always, you can also send your own personal review requests via email if you'd like to see something that we didn't cover yet. Sideshow Collectibles Directly Quotes Our RDR On General Grievous! Holy cow! Sideshow Collectibles takes a quote from our Research Droids Review of their awesome General Grievous 1:6 Scale Figure and posts it in their General Grievous give-away promotion video (and even calls us their friends)! It's incredibly awesome that they're reading what we have to say about their gorgeous products! Check it out! Would You Support This The Vintage Collection Basic Figure Exclusive? The Star Wars exclusives at Entertainment Earth haven't been all that exciting in recent memory. But there are some great possibilities that would cost Hasbro very little money while appealing to the adult collector facet of buyers. (You know, Hasbro, the collectors with $$$). Let me pose a question to our viewing audience. Would you buy the proposed The Vintage Collection exclusive? Click through for more. Revenge Of The Sith Toys R Us Midnight Madness: 9 Years Ago Tonight! Nine years ago tonight, many of us were at Toys R Us waiting for midnight jumping up and down in line ready to get our paws on the latest Hasbro Star Wars merchandise for what we thought would be the final Star Wars film (ever). Nine years ago! Why does time travel at lightspeed the older we get? Recount what you did on this day nine years ago with us in our comments. Share your funniest stories, or maybe just discuss what your anticipation was like for the final film in the Prequel Trilogy. Special thanks to Darth Eddie for the anniversary reminder and the article idea. Click through for more and to join in the discussion. The Power Of The Jedi line brought the first concept art figures based on The Phantom Menace to collectors. Qui-Gon Jinn (Jedi Training) is one of these figures. See this in depth in our Research Droids Reviews today. Be sure to leave your own thoughts in our comments section, vote in the poll or even leave comments about it on our Facebook page. Click the banner below for the direct link to the review! As always, you can also send your own personal review requests via email if you'd like to see something that we didn't cover yet. Adam Pawlus: I Am Calling You Out! The fortune teller has contacted JTA again, although, only one tiny "new" detail has come out of this latest visit, but more has been further confirmed. If you are as curious as we are, then click through to see the new tidbits of information that have been discovered. But be warned, with every good comes something bad. Enter if you dare!! Solid Darth Plagueis Case Packs? JTA readers John McCartney, George Starr and yours truly, Paul Harrison confirm store reports of local TRU locations receiving solid cases of The Black Series 3.75" Darth Plagueis figures! Could 6" Stormtroopers be next? Please let us know what you're finding out there too! JTA Facebook friend Craig H. posts an extraordinary find at his local discount shop. Click through for his report! Happy 64th Wedding Anniversary to my grandparents, Mom-mom & Pop-pop Harrison. I love you both and I am so fortunate and grateful that you're still here with your family on Earth! May the Force continue to be with you! Check out the latest newsletter from BigBadToyStore.com. Boring Conversation Anyway #52: Are We Collecting Or Hoarding? Another week has passed and it’s time for Yakface.com to look back at the latest news in Star Wars collecting. On this episode of The Realm Recap they chat about custom figures and purchases, new reveals from LEGO, Medicom and Hallmark, plus they cover our recent acquisitions since our last show. Click on through to check out the latest episode and feel free to subscribe to their channel and leave suggestions on what you’d like to see covered (more or less) on the show. The Power Of The Jedi line brought us the first concept art figures based on The Phantom Menace to collectors. Darth Maul (Sith Apprentice) is one of these figures See this figure in our Research Droids Reviews today. Be sure to leave your own thoughts in our comments section, vote in the poll or even leave comments about it on our Facebook page. Click the banner below for the direct link to the review! As always, you can also send your own personal review requests via email if you'd like to see something that we didn't cover yet.